A quick foray into SMEBE and Reichsarchiv yields some results . The only set of figures that I find that give comparisons are for April to July 1917 inclusive, which covers Arras, Messines, Nivelle and opening of Third Ypres. For the British , confirmed killed in action for that period in France and Belgium total 59,203. The German figure, inflicted by the British, is 29,642. There it is : pretty well two to one....although , of course, we have to reckon with - in addition to those confirmed killed - the missing presumed dead and died from wounds, which very significantly increase final fatalities . Despite smashing success at Vimy and Messines, this is a no better - or worse - exchange rate than that of the later phases of the Somme fighting. In terms of missing, the Germans reveal a very heavy loss against the British : 40,806, compared with a British loss of 21,872. The successful captures of many thousands of German prisoners are reflected here. The majority of the British missing had been killed. Killed and missing combined give roughly eighty thousand British against seventy thousand Germans : since a prisoner is as total a loss as a man killed, this is an exchange rate that augured ill for Germany. In that period, the French counted 87,000 killed and missing, and managed to kill or capture 86,407 Germans. Attritional success, of sorts, for the Entente....but in terms of actual loss of life, a grim balance for the British. All these statistical musings of mine need some kind of consummation . Suffice it to say that, despite having honed their tactical skills to the level necessary to win a Vimy or a Messines, and to take tens of thousands of prisoners in the process, in the first half of 1917 the British and Dominion troops still had to lose five men killed for every three Germans . In human terms, this is a terrible forfeit. It goes to show how awful the task of the offensive was, and what a daunting firepower advantage the defensive conferred. What a task for the Entente commanders and the soldiers they led ! In mitigation, it’s apparent that, when the role was reversed and the Germans attacked the British almost exactly one year later in almost exactly the same place, the British exacted full retribution, with interest, when it came to the exchange in lives. Was James Roy confirmed as killed in action ; or was he reported as missing and subsequently presumed dead ? Or, addressing the point you make about inclement weather, was he one of the nearly seven thousand British Empire troops who were recorded as dying from wounds in April 1917 on the Western Front ? Died of wounds, death registered as 24th April in the Tunnel Trench sector made famous by Sassoon and Richards whose battalion was in the same brigade as Roy's. From their testimony and others collated by my friend John Drouot, whose wife Jane is James Roy's great niece it seems most likely that he was badly wounded. He may have been seen alive by a comrade, but subsequently died and his body moved out of the way in a very active sector only to be lost. But that is of course supposition. He's on the Arras Memorial, as is his brother. The numbers you have produced continue to be really illuminating, thanks again. 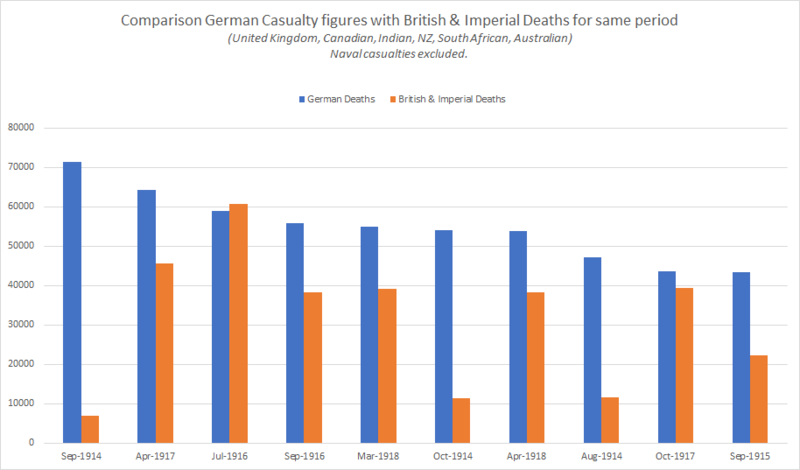 I've taken your data and plotted deaths recorded by CWGC for British and Imperial troops for the same periods. This is truly staggering: it shows the Germans losing a war of attrition without any doubt. Don’t forget that the graph does not include the French figures, which would make the shape dramatically different. Many years of research into these figures have emboldened me to ask help from Pete. I hope you won’t think me presumptuous if I ask you to use your graphic skills and present something which demonstrates the progress of the war of attrition on the Western Front 1914-18. I’ve put heart and soul into this, and it would be great to see my findings presented in the way you depicted earlier. The figures I use here are “ rounded “ and are not exact : they just give a sense of the thing. The best guess that I can come up with is that the Allies suffered a loss of 1,950,000 in killed or died from wounds in France and Belgium, and that and additional 700,000 were taken prisoner. There were an additional quarter of a million non battle deaths which I exclude. The most astonishing thing about the Allied figures is the incredible loss in killed and prisoners suffered by the French in August and September 1914 : just six weeks of fighting account for one fifth of the entire French loss in dead and prisoners throughout the war. The Germans, I believe, suffered a loss of 1,350,000 killed or died from wounds, and yielded 775,000 prisoners. Again, the remarkable thing is that almost exactly half of all the Germans taken prisoner were captured between July and November 1918. I have excluded the deaths of approaching 150,000 Germans from non battle causes. The figures indicate that, between 1915 and 1917, the proportion of German prisoners increased significantly. There was a particularly large haul of German prisoners in the second half of 1916, when at least 100,000 were taken. Before I attempt to present a year by year summary, I’d better check that there is an appetite from the forum for them, and whether Pete or any other pals might be kind enough to assist with providing the graphics. Now I’m going to stride out along the Jurassic Coast and enjoy a Leffe beer or two. Hoping to pitch these figures on my return this evening : will understand if they’re not desired ! Peter has very kindly offered to make a graph from some statistical data that I’ve sent to him by PM. I must emphasise that these are for killed, died of wounds and prisoners : a huge category of wounded is excluded. In addition, large numbers of men were invalided out of service, such was the ordeal in body and soul. April 1917 was a particularly harsh month, both in terms of intensity of battle and the dreadful weather. I would guess that one quarter of all the wounded who were able to survive their wounds were permanently removed from front line service. Phil, I for one have an appetite for any figures you care to share with us, and I'm seriously envious of you being able to ponder them while walking coastal Dorset; watch out for those belemnites and ammonites. Delighted to report that Peter has drafted a graph that shows just how the attritional war developed. The statistics are based on my own research ; I do have to confess that there is a deal of supposition and - I fear - a degree of what might be called a priori approach involved, but I honestly think that it would bear scrutiny and provide a reasonable base for further investigation . The overall impression is that the disparity in casualties diminished until the German losses matched and even exceeded those of the Allies. A statement of the bleeding (!) obvious....but I’m gratified to see it displayed this way. In the meantime, I have every intention of striding out again over these gorgeous Dorset cliffs and beaches. I eagerly await interpretation of what these figures imply. A million thanks to Peter. Note that the top data label is the Total of prisoners plus Killed/Died of wounds; subtract the two numbers to obtain the number of prisoners. That was embarrasing! Thinks it's correct now. You have been more than kind, Peter, again, my thanks. That’s put the roof on my efforts. Talking of numbers , I’ve just walked 16,656 steps - 6.3miles - across Studland Beach and back, and will now look at the view from the van’s deck while I sip some wine.